In the scene of the final judgment that Jesus presents in the Gospel, both the just and the unjust ask our Lord when they have seen him hungry, naked or sick, and assisted him or failed to do so: “Truly, I say to you, as you did it to one of the least of these my brethren, you did it to me” (Mt 25:40). The corporal works of mercy are a response to these words of Christ. “We have to open our eyes;” says St. Josemaría, “we have to look around us and recognize how God is calling us through the people at our side. We cannot turn our backs on others, ignoring them, because we are caught up in our own little world. That wasn’t how Jesus lived. The Gospel often speaks of his mercy, his ability to feel the sorrow and share the needs of others” (Christ Is Passing By, no. 146). The first manifestation of the works of mercy is solidarity with all those who are suffering, even though we don’t know them. “Not only are we concerned about the problems of each person, but we are in full solidarity with our fellow citizens in public calamities and misfortunes, which affect us in the same way,” said St. Josemaría back in the 1950s (Letter of February 14, 1950, no. 20). Although it is not possible for us to be aware of all the sufferings of every man and woman, nor to provide a material remedy for all their problems, Christians cannot be unconcerned about them, since they love all men and women with the heart of God: “Who is weak, and I am not weak? Who is made to fall, and I am not indignant?” (2 Cor 11:29). Christian solidarity is made a reality then, in first place, by praying for those who are suffering, even though we do not know them. In most cases we will not see the results of our prayers, made up also of work and sacrifice, but as the Pope said, we are convinced that “all of these encircle our world like a vital force” (Evangelii Gaudium, no. 279). Solidarity is also shown in “simple daily gestures which break with the logic of violence, exploitation and selfishness,” in the face of “a world of exacerbated consumption . . . a world which mistreats life in all its forms” (Laudato si’, no. 230). All of us, young and old, have to learn to detect the small daily needs of those who live with us. In a special way, we need to accompany closely family members and friends who are sick. Medical science has made great strides in finding ways to improve the condition of those who are sick, but none of these technical means can replace the human closeness of someone who, rather than seeing in a sick person a burden, sees there “Christ passing by,” Christ who needs our care. “In the sick, a soul in love sees Him,” wrote St. Josemaría (The Way, no. 419). For as our Lord himself assured us, “Truly, I say to you . . . you did it to me” (Mt 25:40). “When did we see you sick or in prison and visit you?” Sometimes it can be difficult for us to see God in a person who is suffering. But those who are sick, precisely because of their weakness, are even more deserving of our love. A divine splendor illumines the features of the sick that makes them resemble the suffering Christ, who “had no form or comeliness that we should look at him, and no beauty that we should desire him” (Is 53:2). Care for the sick, the elderly, the dying, requires a lot of patience and also generosity with our time, especially when a specific illness lasts a long time. 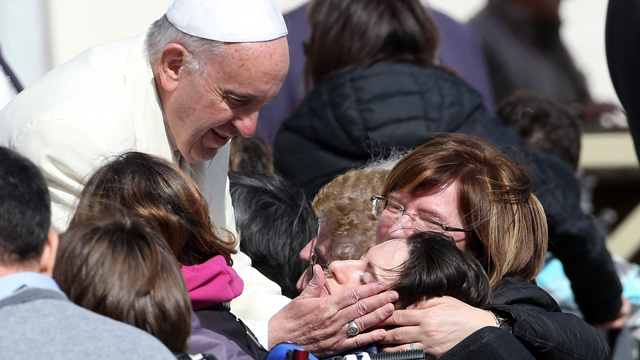 The good Samaritan “also had his commitments and his things to do,” said the Pope in his audience at the end of April. We are asked to take this responsibility seriously, without resorting to coldhearted solutions that in the end amount to discarding those who humanly can contribute very little. Our Lord says, “If you know these things, blessed are you if you do them” (Jn 13:17). God reserves a blessing filled with tenderness for those who strive to care for the weak: “Come, O blessed of my Father” (Mt 25:34). It is easy to detect around us many material needs: families who have emigrated fleeing from war, people who are unemployed, “those bound by new forms of slavery in modern society” (Misericordiae vultus, no. 16) such as drug addiction, hedonism, gambling…. One hardly knows where or how to begin. Experience shows that many small initiatives, aimed at solving a specific need in our immediate surroundings, and begun with whatever one has at hand and with whomever one can (most of the time with more good humor and creativity than time, financial resources, or help from public entities) end up doing a lot of good. Generosity generates a gratitude that is a springboard for new initiatives. Mercy begets mercy (see Mt 5:7), and is contagious. Thus the Gospel parable of the grain of mustard seed is fulfilled: “it is the smallest of all seeds, but when it has grown it is the greatest of shrubs and becomes a tree, so that the birds of the air come and make nests in its branches” (Mt 13:32). The needs of each place and the possibilities of each person are quite varied. The best plan is to choose something that is within our reach and get to work. Over time, often less that we think, doors will open that seemed permanently shut. And we can reach out to help those who are in prison, those who are captives to so many other addictions, who are abandoned on the roadside by a world that has discarded them when broken. Recalling his first yeas as a priest in Madrid, Saint Josemaría spoke about going to the poor areas surrounding the city “to dry tears, to help those in need of help, to show affection to the young, the aged, the sick; and I received a lot of affection in return . . . along with at times stones thrown at me” (Notes from a family gathering, October 1, 1967, in AGP, P03, December 1967, p. 26). And he dreamed of the initiatives that today, along with many others brought forward by people of good will, are now a reality all over the world, and which need to continue growing quasi fluvium pacis, like a river of peace. “Today this is like a dream to me, a blessed dream that I see in so many impoverished areas of large cities, where we treat people with affection, looking in their eyes, face to face, because we are all equal” (ibid.). Romana, No. 62, January-June 2016, pag. 8-12.